Common Myths About Weight Loss – I’m here to clear some of the confusion about these weight loss myths. There is so much talk about how to lose weight that it can be sometimes a little difficult to decide which the facts are and which are pure fiction. Here are a few of the most common myths about weight loss. Myth: The only way to lose weight is with a radical exercise program. The best way to lose weight and maintain your healthy weight is to make small changes to your diet and lifestyle which you can adopt for the future. Losing weight begins in the kitchen not in the gym. By all means you should incorporate some activity into your life but you’ve still got to watch what you eat. Eat less, move more, lose weight and feel great. Myth: Healthy foods cost more than unhealthy foods; I can’t afford to lose weight. The truth is that it is often cheap to eat a healthy diet than it is to buy pre-packed, processed foods. You will pay a lot more for a ready meal than you would have to pay to buy the wholefood ingredients fresh and make it yourself. The fact is that you are unlikely to sustain any weight lost due to a crash diet, as soon as you start eating again you are likely to pile the weight back on again plus a few extra pounds. Crash diets are so difficult to maintain that as soon as you start to eat again you often eat more than you actually need. The best way to lose weight is to adopt a healthy eating lifestyle whereby you can lose weight slowly and keep it off without ever feeling hungry. Your activity levels, and certain medications can also make you more hungry. It’s good to find balance between exercise and food so that it works for you, not against you. It isn’t the fact that people take a snack that’s the problem; the real problem is what they choose to snack on. Lots of people need to snack between meals to keep their energy levels up, particularly those people with an active lifestyle. Many snacks are high in sugar and fat so avoiding things like chips, cookies and chocolate and replacing them with things like fruit or vegetables means that you can enjoy a snack without gaining excess weight. Although this one is almost true! What happens is that the water keeps you hydrated (very important for your health) which stops you from getting the urge to snack or overeat. 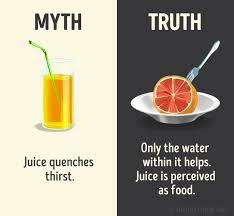 People who are thirsty can often mistake the signs for hunger and reach for something to eat when in actual fact a calorie free glass of water would have done the trick. There are many more weight loss myths which I’m sure you’ve heard of, this is just a snapshot of some of the most popular misconceptions which people have about how to lose a few pounds. Remember that adopting a healthy eating and exercise program is really the only way to lose weight healthily and maintain the new you. Please contact me, If you would like to learn more and setup a free consultation with me.